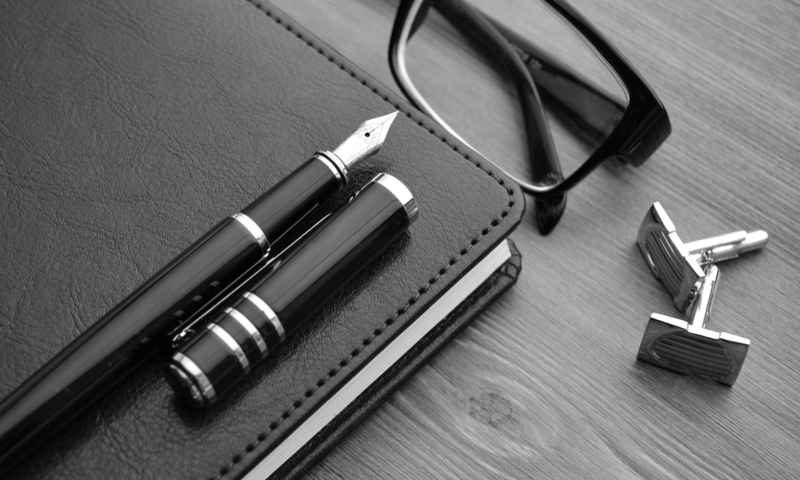 We know that many of our readers love to use the deepest, darkest, most intense black fountain pen ink that you can find. 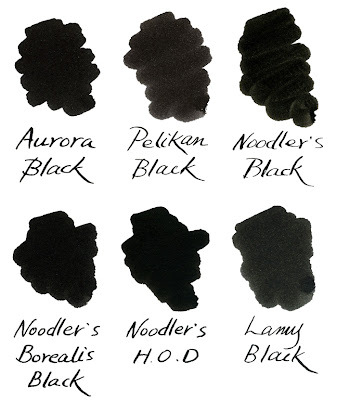 Writer’s Bloc decided to do a simple comparison of some popular black inks and then pass the results on to you. In this test we used a Clairefontaine drawing pad, a Brause calligraphy pen and a Q-tip. Aurora Black – A true black color, good flow, not waterproof. Pelikan Brilliant Black – Kind of a grey-black, not waterproof. Noodler’s Black – A warm black color, "bulletproof", has a "creamy" feel against the paper. Noodler’s Borealis Black – Water resistant, very penetrating. Noodler’s Heart of Darkness – "Bulletproof", dries with a tiny bit of shine. LAMY Black – A cool black with blue undertones, not waterproof. I’m fond of the black unshaded super-saturated black of Private Reserve Ultra Black as well, but I will definitely check out some noodler’s HOD when I find a couple of nickels to rub together. Just a note, Noodler’s HOD is *not* bulletproof. It is eternal – which gives rise to a different subset of qualities such as anti-fading. I tend to view them as the same, but not everyone does. David – Thanks for the clarification! I prefer the Namiki black, although I may be willing to try the two Noodler’s now. Thanks for the comparo! I’ve used the Noodlers 4.5 oz Black Ink. It is eternal & bullerproof. At least that’s what it says on the bottle label. I was informed that it is the blackest ink around. However I was told that Aurora Black is the blackest. Although I’ve never tried it. Mel – Noodler’s black with its eternal and bulletproof qualities and reasonable price make it a very popular ink! Our small test showed Aurora black ink to be a bit more saturated than Noodler’s black, and even though it is not waterproof a lot of writers love it too. If you decide to try Aurora let us know how you think it compares. Thanks for your input! I wish that you had also tested the Platinum Carbon Black. I have used it and the Noodlers with good results. We are thinking of including Platinum Carbon Black with some future tests. Thanks for the suggestion!